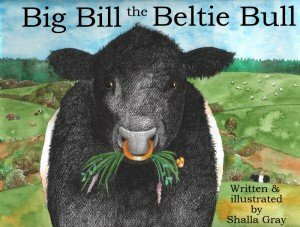 Big Bill the Beltie Bull is the latest book by Shalla Gray. This lovely picture book features fabulous watercolour illustrations of Big Bill in his beautiful Galloway home where he’s happiest on his hillside eating grass. When Miss Mowdie the farmer fetches him one day he wonders what’s going on. He gets a wash and a haircut, what could be going on? When he finds himself being taken to the local agricultural show he wonders what’s going to happen next. Find out in this lovely new book by the author of Charlotte’s Woolly Yarn and illustrator of The Quite Big Rock. Pauline Paterson children’s author and illustrator. Renita Boyle, children’s author and storyteller.